An ectopic pregnancy is a rare medical condition where the fertilized egg is implanted outside of the uterine cavity. This is a life-threatening situation since there is a risk of rupture and hemorrhage. Learn more about the signs and symptoms of ectopic pregnancy. Find out what puts a woman at increased risk of tubal pregnancy. In rare cases, a fertilized egg does not implant itself on the uterus but instead gets implanted outside the uterus. In most cases, this type of implantation takes place in the fallopian tubes. Ectopic pregnancy or tubal pregnancy is a medical emergency that needs to be attended to immediately. When the embryo implants itself outside the uterus, it neither gets the requisite space nor nourishment that is so essential for its growth. The fallopian tubes are too narrow for a rapidly growing pregnancy and there is every likelihood of rupture. The rapidly growing fetus can lead to bursting of the organ on which it has been implanted and there may be severe bleeding. This puts the life of the expectant mother in danger. Women who have been on fertility medications to stimulate ovulation are more at risk of developing ectopic pregnancy. Previous history of Pelvic Inflammatory Disease (PID) also increases the chances of a tubal pregnancy. Due to PID, the fallopian tubes may be scarred and obstructed. This may prevent the movement of the fertilized egg to the uterus. Any history of tubal surgery or pregnancy after tubal ligation increases the risk of ectopic pregnancy. Endometriosis is yet another cause for ectopic pregnancy. Often the signs of ectopic pregnancy may be difficult to detect in the early stages. Sharp and stabbing pain in the abdomen or pelvic region is the first indication of a possible ectopic pregnancy. Other symptoms of ectopic pregnancy are low blood pressure and dizziness or fainting spells. Vaginal bleeding is another symptom of ectopic pregnancy. It is essential that you see a doctor at once if you notice the above symptoms since they may be indicative of internal bleeding. Ruptured fallopian tubes can result in bleeding that can cause significant pain and scar tissue formation. This can have a bearing on the woman's ability to become pregnant again. 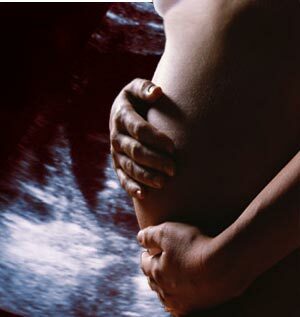 An ectopic pregnancy is usually detected within the first 8 - 10 weeks of pregnancy. Blood hormone levels of beta human chorionic gonadotropin (beta hCG) and progesterone are often indicative of an ectopic pregnancy. Typically in a case of ectopic pregnancy, the levels of blood hCG are lower. A pelvic ultrasound will indicate the location of the pregnancy and if there is a case of tubal pregnancy. A laparoscopy can help indicate the exact location of the tubal pregnancy. If the ectopic pregnancy does not result in a spontaneous miscarriage, certain drugs such as methotrexate are used to kill the placenta cells. This induces abortion of the ectopic pregnancy. This form of treatment is resorted to if the diagnosis of ectopic pregnancy is detected early. Surgery is performed on cases of ectopic pregnancies that are more advanced.